Visitors to the 20th Euromold exhibition can learn how WorkNC, from Vero Software, automatically generates 5-axis toolpaths from existing 3-axis paths. Training Manager Juergen Frank will present “WorkNC Auto5-Innovation With Short Tools” during the exhibition’s Rapid Prototyping conference in hall 11 on December 5. WorkNC Auto 5 has been described as a revolutionary innovation in the field of 5-axis CNC machining. 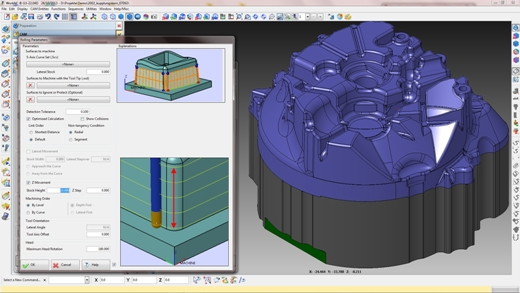 Users automatically generate 5-axis collision-free programs based on existing 3-axis toolpaths while taking into account the specific kinematics of the 5-axis milling center selected. The new WorkNC Dental V4 will feature on WorkNC’s booth – F22 in hall 8. This latest version of the dental solution provides a wide range of innovative automatic machining functions for dental prosthesis, whatever the process. It includes new automatic cavity recognition for fully automatic machining on both 3 + 2 and 5-axis machines, through the faultless detection of concurrent or diverging insertion axes. This new functionality provides optimal use of 3+2 machines which do not have simultaneous 5-axis capabilities. Another step forward in its automatic machining processes: machine characteristics and kinematics are now taken into account before calculations are run. This means users are immediately aware of any feasibility issues, managing project preparation in real time. And visitors to the exhibition can see the software in action on the Datron booth (D68, hall 8), which will include machining Chrome Cobalt and Titanium dental implants using WorkNC Dental on a D5 dental CNC 5-axis mill. In addition, WorkNC V22, WorkXPlore 3D V3,WorkPLAN SolutionsV3 will all be on show at the exhibition, which is being held at Frankfurt in Germany, from December 3 to 6.